Release Date: 19th August 2009. Producer: James Ford & Josh Homme. Singles: Crying Lightning, Cornerstone, My Propeller. Humbug really shows what Arctic Monkeys are capable of, with both up beat, and slow rhythms, and an all ways on point voice to sing the amazing lyrics. The gloomy theme can easily take over the whole album, fortunately "Secret Door" and "Cornerstone" helps give the album a new life. Frontman Alex Turner stayed in New York to oversee the mixing of the album and maybe that is what makes this album so remarkably good, possibly one of the best in the indie rock genre over recent years. Arctic Monkeys have released five studio albums to date, Humbug being the third. I was happily surprised by the lyrics of Humbug and I also love the way that every tune has a moment just for the music, no words needs to be said; every feeling and mood is there in the music and everything is thought all the way through. 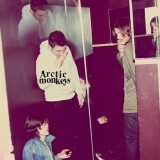 Humbug is a somewhat bleak album with dark, deep sounds, dominant beats and good lyrics. Everything, from the bass, drums and guitars, to the signing and the lyrics fits perfectly together. Arctic Monkeys knew exactly what they were doing with Humbug and they did an outstanding job. It is as if the 3 first songs: “My Propeller”, “Crying Lightning” and “Dangerous Animas” in the rhythms, moods, sounds and feelings tells us a story; a horror story. You can almost see yourself standing in the middle of a cemetery on Halloween night, frightened to death! But you completely forget that, as soon as the fourth track “Secret Door” starts. The calming and dreamy downbeat start is the perfect way of contrasting the dark, deep and gloomy sound that only a few minutes ago started to fill your ears. As this more romantic tune almost makes you dose off, the guitars and steady beat from “Portion Approaching” wakes you up for a more bizarre and mesmerizing kind of tune; which just shows why Arctic Monkeys are sometimes classed in the psychedelic rock genre. Midway through, the tune changes to some sort of march music, but it keeps the same lyrics and this makes this tune more compulsive and refreshing. “Fire And The Thud” takes us back to a dreamland, with fairytale creatures, but soon the raw voice of Alex Turner takes us back to reality. The lyric is in the centre of this song and the music is only there to give some sort of rhythm for the voices to follow. At the end, it all kind of explodes and we get to hear a more feminine voice, which gives this song more life. “Cornerstone” jogs your memory back to “Secret Door” but is, if possible, even more downbeat and slow. This works though and it makes the tune more pure, vulnerable and exposed. Even Alex Turner´s voice is more smooth and delicate despite his normally raw and rough voice. “Dance Little Liar” is without doubt my absolute favourite song on this album. There’s just something in the beat that makes me want to listen to it all day long. It is a catchy tune, where both music and lyrics are at their best. The first tones of “Pretty Visitors” kind of put me off, but as soon as you hear the recognisable fast beat, you’re hooked – which again shows the psychedelic rock sound that I’ve fallen for. This tune is a lot more punk than the others and it happens at a great time, just before this amazing album ends off with “The Jeweller’s Hands” which is slower but again, it has the gloomy mood we started off with. This is a great way of getting it all together and ending it all in a nice rounded way. Find the most competitive price for ‘Humbug’ in the table below. If viewing from a mobile device please click on + to get more information.